Kimberley City Portal is the most popular and well known directory for Business, Food, Entertainment, Activities, Tourism and Events in Kimberley. KCP serves as a gateway connecting consumers to business and tourism as is also an excellent business to business platform. market and promote your business, products and services. The Portal's function is not to directly sell your product and service, but to drive customers to your business, providing you with valuable leads and direct contact. How KCP directs consumers to your business. The consumer will easily find businesses providing the needed product or service. The consumer is guided to click on your listing for further information. The consumer can easily determine if your business will be able to provide them with the products and service they require. The consumer can see that your business is professional, trusted, reliable and provides excellent customer service. The consumer will be steered to fill in an enquiry form, directly e-mail, phone your company, or to visit your establishment. 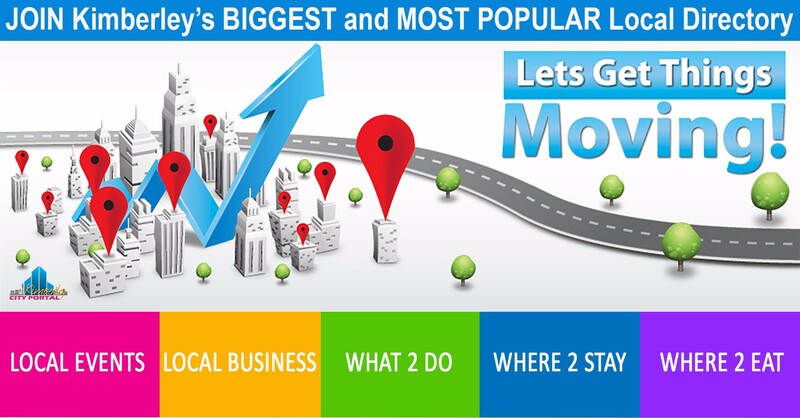 How Kimberley City Portal does all of this for your business. 1. The consumer must be able to easily find businesses providing the required product or service. An Excellent Google Reputation and High Google Rankings ensure a high volume of consumers visit our website looking for reputable businesses and services providers. Categories and listings are SEO (Search Engine Optimization) optimized to help consumers quickly find what they are looking for. Our Social Media team monitor popular Kimberley social media platforms to advise consumers and to direct consumers searching for a product and service to the relevant KCP Category list. Daily posts on different platforms and social media inform and direct customers to businesses on City Portal. Alliances and working arrangements with different organizations direct traffic to the City Portal Website. 2) Guiding consumer to click on your listing for further information. An optimized cover image and short into for your listing will help it to stand out, entice consumers to click on your listing. 3) The consumer must be satisfied that your business will definitively be able to provide them with the product and services they require. A well written intro and listing content in conjunction with a good flowing structure is essential in convincing the customer to decide on your business, or to read further for more information. • Well set out detailed information can provide the final push towards your business. Our content team will rewrite and optimize your company, product and service information to limit drop off rates and increase contact rates. 4) The consumer must be convinced that your business is professional, trusted, reliable and provide excellent customer service. A professional, high quality, visually pleasing listing goes a long way to show that your business is highly professional and serious about quality. Good ratings and reviews is the number one method to convince consumers that your business is trustworthy, reliable and provide quality products and excellent service. Design packages are available to give your business the professional and trusted look it deserves, helping your business to stand out from the crowd. Our highly skilled design team will create graphics and polish the look of your listing providing an attractive, professional showcase for your products and services. 5) The consumer must be steered to fill in an enquiry form, directly e-mail or phone your company, or to visit your establishment. Although ROI (Return on Investment) measurement is important when investing in advertising and marketing, actually transacting with customers is the final and ultimate goal. Rather than employing much used practises such as partial phone number displays, only one contact gateway and directing unrelated enquiries and traffic to your listing, we list all available contact gateways to your company to ensure that the most convenient method for each visitor is offered. This minimises bounces and drop-offs for your listing, and promote return visits. The process of finding, evaluating and contacting your business is made as quick, convenient and easy as possible. Consumers are looking for trusted companies providing quality products and a high level of customer service. The built in Ratings & Review system allow consumers to rate businesses in Kimberley and to quickly find highly rated companies providing excellent customer service. To highlight service excellence, businesses are sorted by consumer ratings. Paid members are provided with tools to build good ratings & reviews on The Portal. Be in your customer's eye. Be easy to find and to contact. Show your business is trusted, professional, reliable and provide quality products and services. Direct complaints to a platform where problems can be resolved, and your business image be protected. We constantly work on new innovations and implement new strategies to drive customers to your business. Recent studies has shown that Google and other search engines rank companies with a detailed listing on trusted local directories higher in search results. 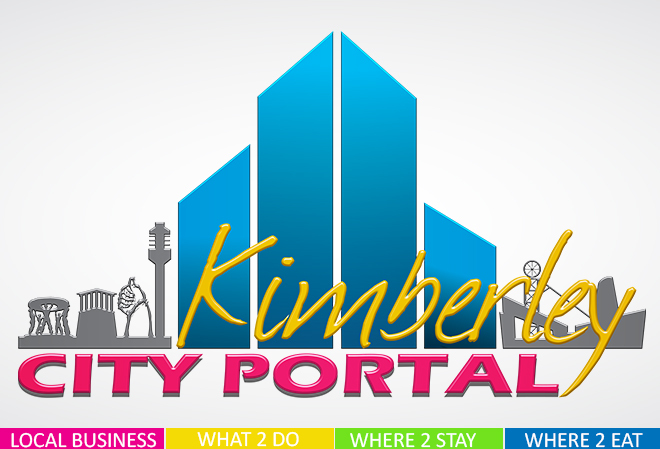 The Kimberley City Portal was created to be of service to both Consumers & Business. Always on time with news. The best place to list local Kimberley business and events.